It’s easy to say that a Facebook chatbot and Messenger Marketing presents a unique opportunity for your business, but if the numbers don’t back it up, you’re likely not to take action. Luckily for us, we’ve got the numbers! If that wasn’t enough, Anand Arivukkarasu, Product Growth Manager at Facebook, shared with the Conversations Conference audience last week that 64% of people would prefer to message vs talk on the phone or email a business! In short: people are looking for quick, customized responses that can easily guide them through the entire buying journey. 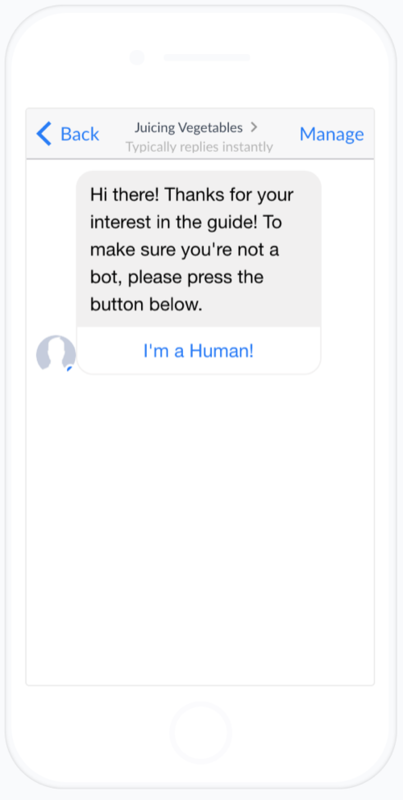 With consumer expectations and Facebook Ad costs on the rise, Facebook chatbots and platforms like ManyChat allow us to tap into this massive communication channel: humanizing our brands, exceeding customers’ expectations, reaching the right people, providing exceptional customer service, and increasing brand engagement. But it’s critical that you approach your chatbot building the right way. Many make the mistake of deciding they need to build a Facebook chatbot for their business, and then just focus on the ‘bot’ angle, foregoing the ‘chat’ part — it’s all about automation and data. Your focus should be on the conversation. Your goal is to successfully sell your product or service to an actual human with the humanized interaction a well-built chatbot can offer. If you think of yourself as a conversation designer, you’ll be on the right track to implementing any of the five strategies I’m sharing with you below. Here’s the great thing… you’re most likely already using these marketing strategies in your business. They’re old hat, and you’re familiar, even if you’re not implementing them all. 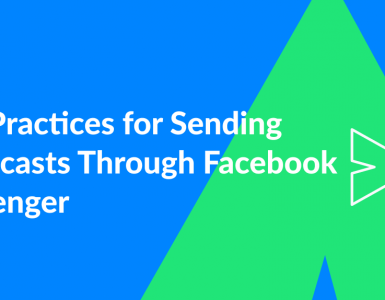 Today, I’ll show you how to put them to work in Facebook Messenger for major impact. 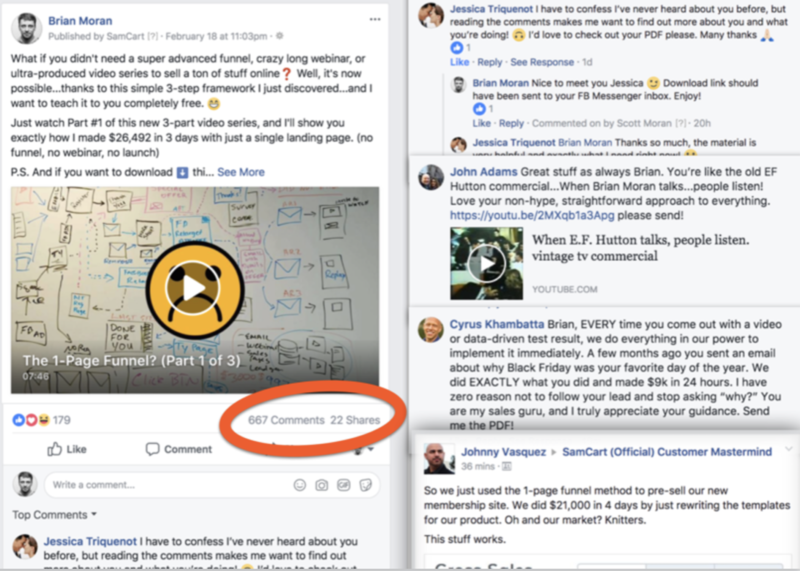 We all know what traditional Facebook Advertising looks like: A user is shown an appealing targeted ad with the offer of a desirable piece of content (your Lead Magnet). They’re immediately redirected to a landing page and met with a prompt and impersonal request for their email address. While there is technically nothing wrong with this approach, it certainly isn’t the greatest user experience, as evidenced by the fact that we often lose 50% of users during that transition alone. 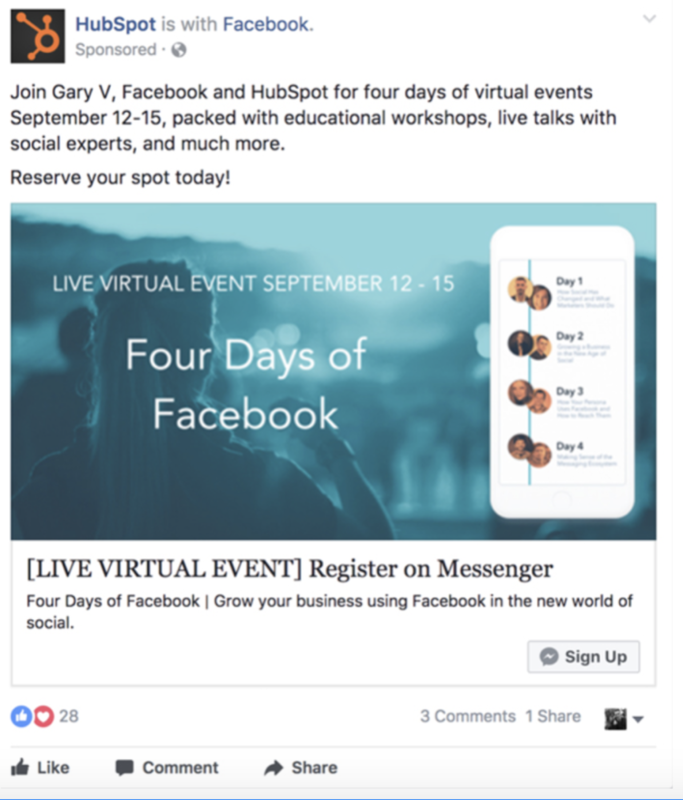 Instead, incorporate Facebook Messenger into your next Facebook Ad campaign. 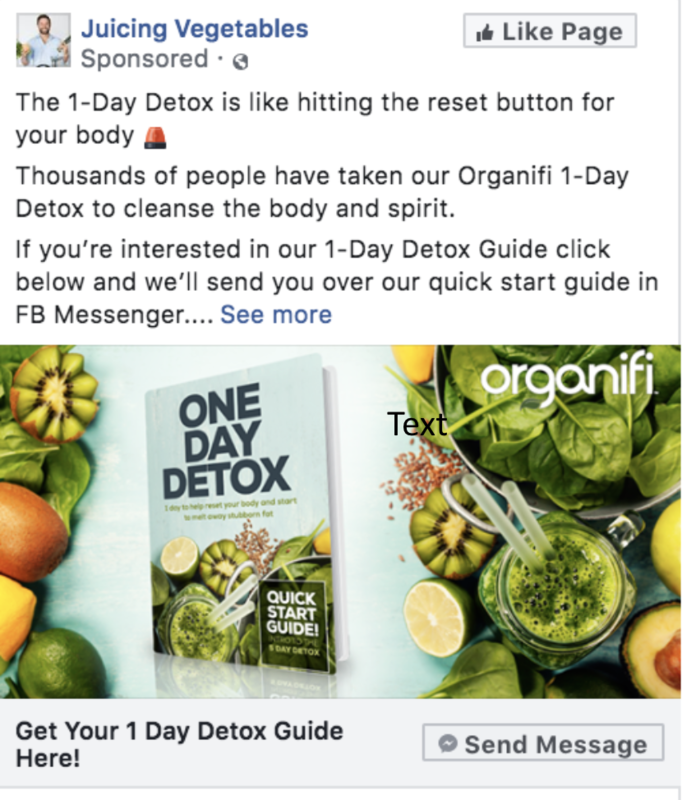 For example, Organifi’s ad is offering users their popular 1-Day Detox Guide, with a strong call-to-action (CTA) that clearly states any further communication, including getting hands on the guide, will take place directly in Facebook Messenger. Don’t forget that when trying this strategy, you will want to tailor your ad copy around the implementation of Messenger itself! Giving your audience a clear heads up that this conversation will now take place directly in the Facebook Messenger platform ensures they don’t assume it’s a bug! Now you can get access to their email address in a much more humanized way. Inside ManyChat, you can create a customized sequence that will continue to offer clear incentive and get to know your potential customer while seamlessly requesting their email address. No need for the abrasive: What’s your email? Within Messenger you have the room to offer that one-on-one approach, conversationally detailing the valuable content the users will receive in exchange for their information. 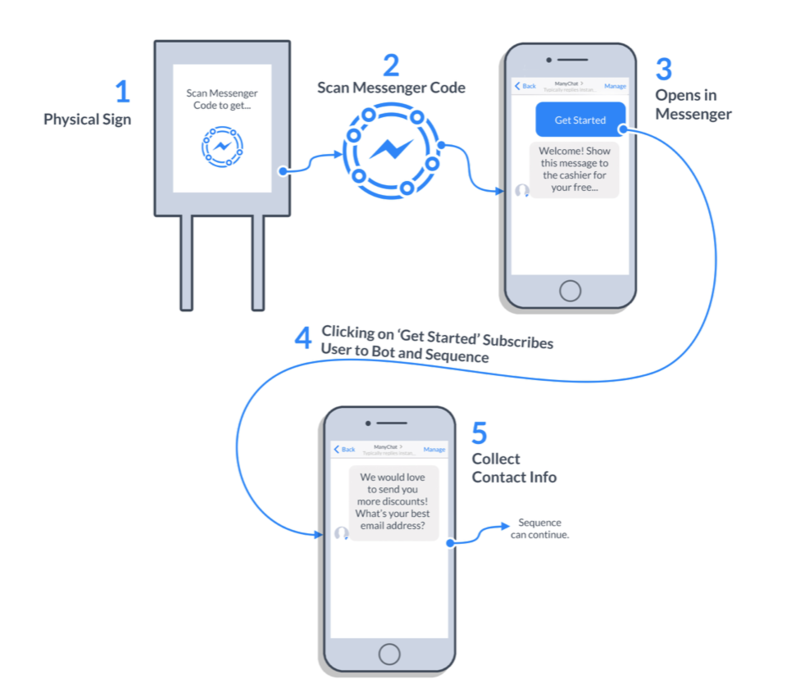 This is an effortless process for users, as your ManyChat bot will auto-populate the email they’ve given to Facebook. You won’t have to worry about any fake emails and the user will barely have to lift a finger! Now you (and your CRM) have the email lead to follow up, your potential customer has the content they were hoping to obtain, and you’ve got a great opportunity to get to know them better. One awesome power of Messenger is the ability to get to know as much about your desired audience as possible. With it’s one-on-one, conversational, back and forth nature, your Facebook chatbot can ask the questions your business needs to really connect. You’re guaranteeing your audience is receiving much more personalized marketing efforts, which is what your customers are ultimately after. While you’re learning about them, ManyChat is keeping track of the answers they give in the conversation, tagging them, much like a CRM, triggering a customized response that fits that specific user. The conversation will shift as a result, helping you better determine just how qualified they are to purchase your product or service and ensuring your future outreaches are tailor-made. While our ultimate goal is to sell the products or services we’re offering, we want to avoid being directly promotional. In order to best do that, we can weave content into every follow-up message, making it all about the user! 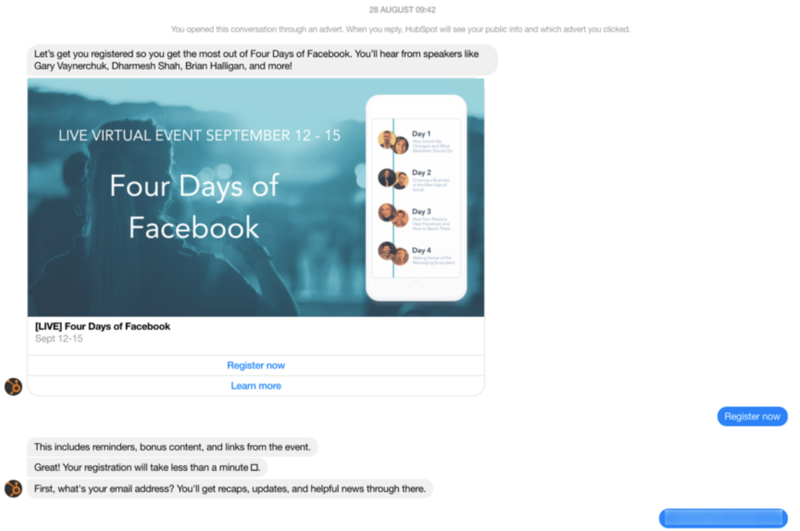 We’re keeping the conversation and traffic in Facebook Messenger itself: leading to a decrease in cost per lead, while offering significantly more personalized service. Local businesses, agencies and service providers, rejoice! Ready for the alternative to the ever-impersonal “contact us” form or button? This is such an easy, quick strategy to implement today that will allow perspective clients or customers to fill out pertinent information directly in Messenger. 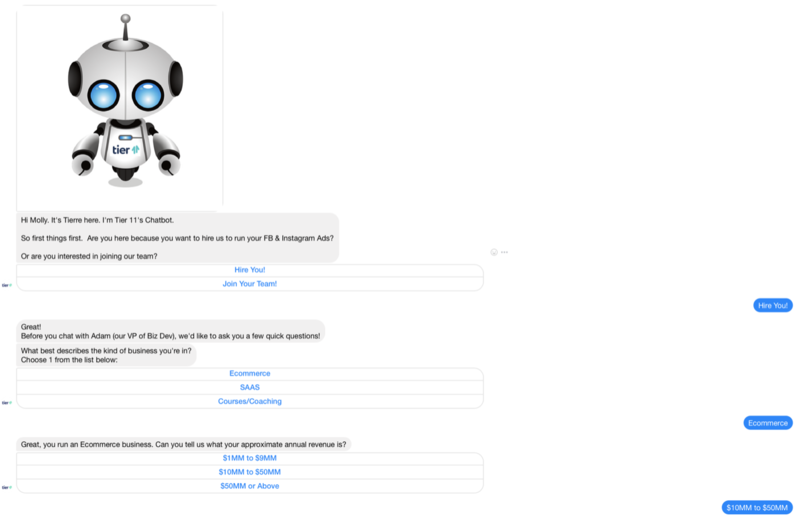 Here’s a cool example from an ecommerce ad agency that wanted to use Facebook chatbots to generate high ticket leads. We knew there had to be a way to send traffic into Messenger for qualified individuals to apply for an open position and with ManyChat, there are 10 different entry points that make that possible. For this example, we wanted applicants to be able to begin the application process directly from an event they were attending. 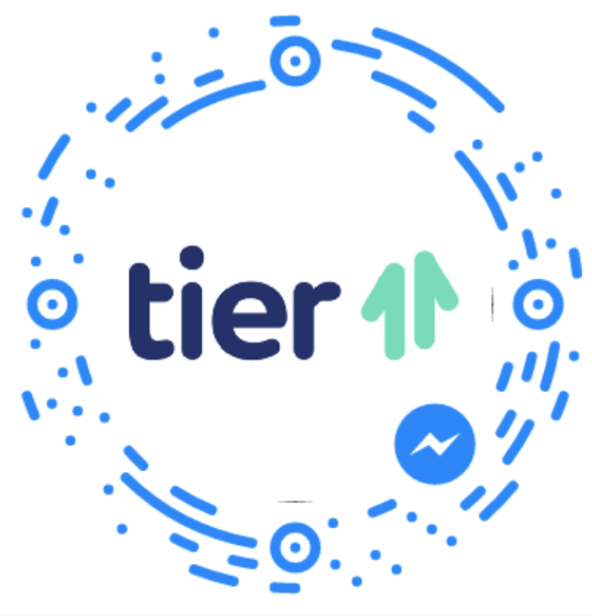 Tier 11 used their unique Messenger code that, when scanned, will open up the application process within Messenger itself. Applicants could begin the process directly from the event by simply scanning the given code with their phone, opening up a direct conversation with the agency. Users can easily answer questions with a chatbot, bypassing tedious webforms completely and better helping ensure they’re an ideal candidate, or if they’ve contacted you because they’re interested in doing business – like I show below. If they trail off after a question or two, you can set your ManyChat to alert a member of your sales team, ensuring they can follow up, answering any questions or concerns one might have. This functionality allows you and your business to qualify people with ease. 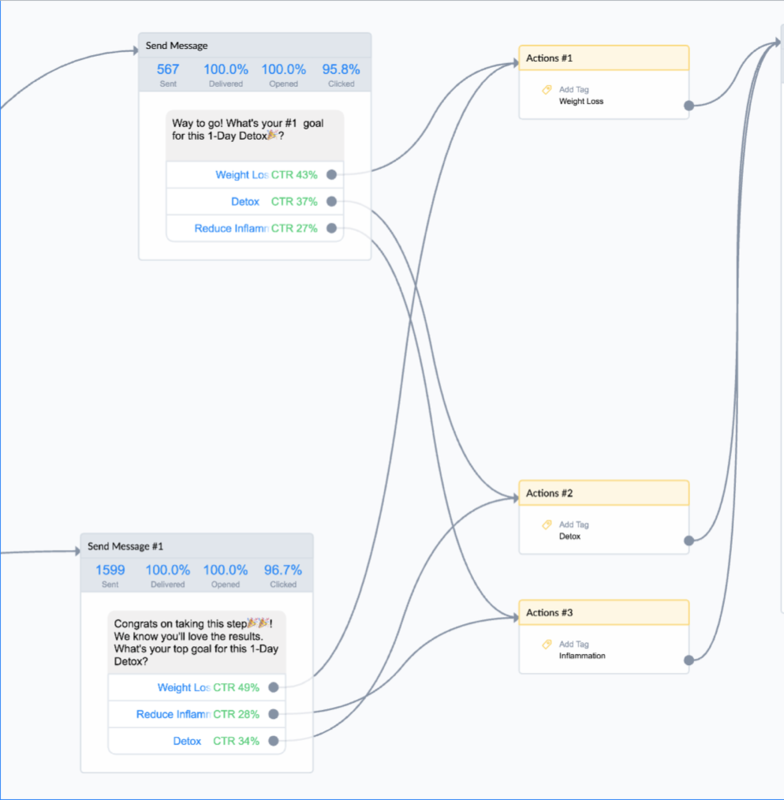 One of my favorite features to use is ManyChat’s Comment-to-Message Growth Tool that allows me to create personalized, unique Messenger conversations, triggered by people leaving comments on Facebook Ads or posts. 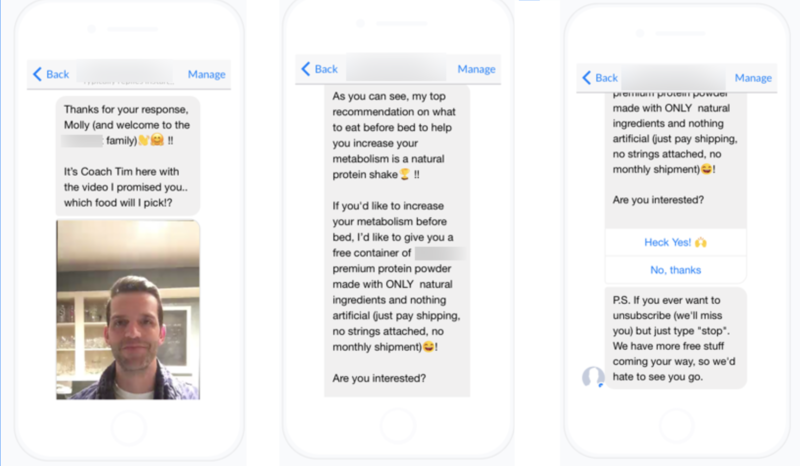 This company is in Health and Fitness industry, posing a question that is geared directly towards their ideal audience: Which is the best food to eat before bed? Notice that they’re staying far away from engagement bait, no yes or no answers here. It’s important to note that you’ll want to avoid such tactics, as Facebook is really geared towards providing the best experience possible, and you don’t want to give them a reason to disable your account. The goal with this acquisition funnel is to sell their protein powder, so naturally the correct answer to the posed question is option 3: a protein shake! As users give their answer in the comments below, they’re receiving the correct answer directly within Messenger: the top recommendation on what to eat before bed (a protein shake), added benefits that are most likely in alignment with their current health and fitness goals (given their expressed interest in the posed question) and a free container of protein powder! It’s important to note that here they can be directly promotional. This is a powerful Growth Tool in so many ways. For one thing, Facebook loves data but even more so, Facebook loves ensuring quality experiences for its users. With this strategy, and really, all Messenger Marketing strategies, your goal isn’t to blast these subscribers with follow-up sales messages, it’s to generate authentic conversation and connection. An added bonus? With Facebook’s shifted focus towards relevancy and engagement, your posts and ads gaining such reactions earn a greater organic reach! Be sure that you always provide subscribers the option to opt out of further communication during that initial outreach – not all users understand that they’re subscribing to a bot and you want to avoid Facebook flagging your bot as spam. 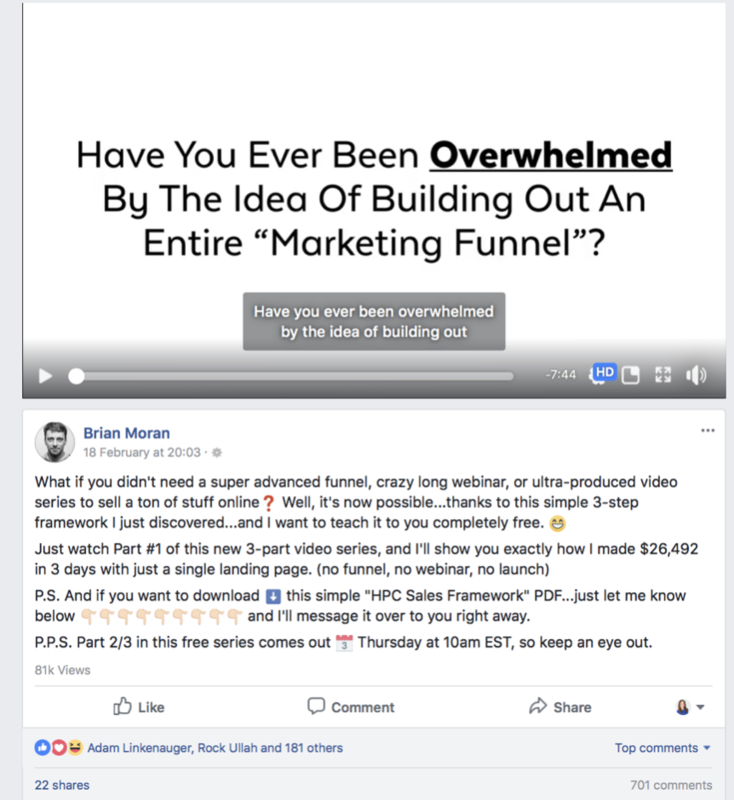 The idea behind this Growth Tool is that video is really the most consumed form of media today but with fierce competition and flooded inboxes, how do we guarantee the amazing video series, mini-classes or challenges you’ve created get the attention they deserve? Messenger and ManyChat are powerful tools to engage as your video delivery mechanism, bypassing overloaded inboxes entirely. If you’ve produced a really engaging series that you believe will educate, entice and excite your audience, consider employing a Facebook chatbot to take advantage of higher open rates, click through rates, and consumption rates. 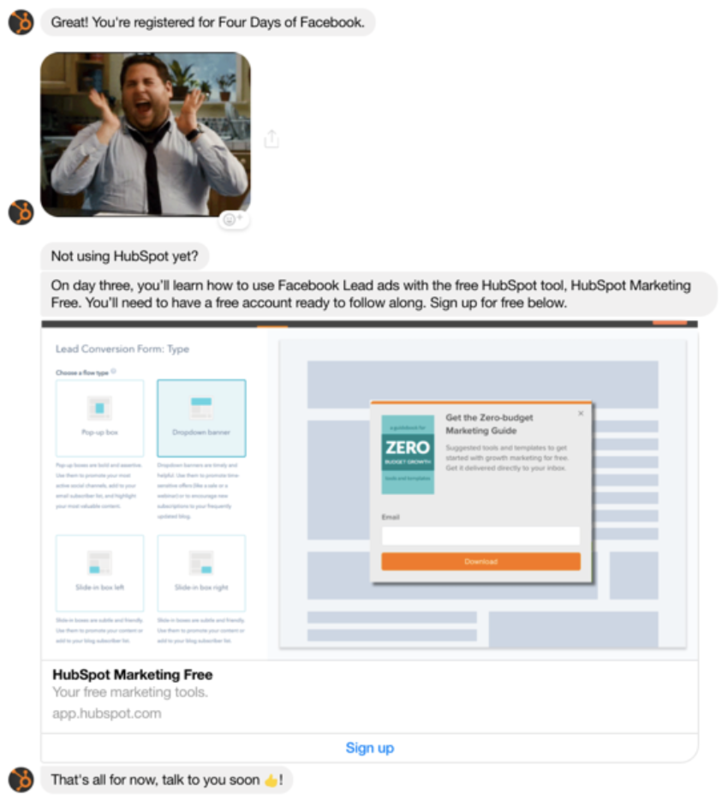 First, we’re asking our audience if they’re interested in this challenge or series with an ad or post, explaining again, that they’ll be receiving this exciting content in Messenger. 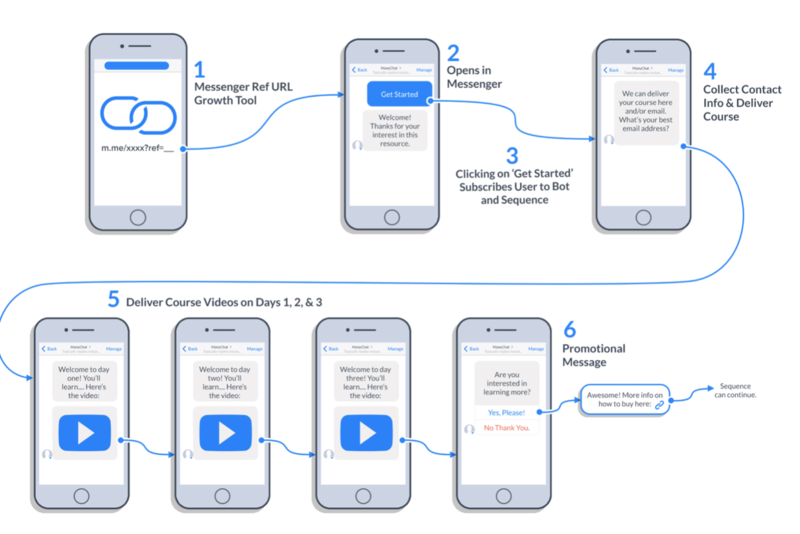 They’re clicking, adding themselves as subscribers, and from there, ManyChat and Messenger will be able to send your audience automated (and personalized) reminders of your video series content. This way you can ensure people are actually engaging with you, and whatever assets your offering! If your business leverages webinars to capture qualified leads, you may have noticed a frustrating conversion rate, or even sinking show up rate with traditional marketing methods. Utilizing Messenger, attendees can register within aFacebook chatbot, making the barrier to entry lower than it’s ever been! Customize the conversation to create a seamless user experience, overcoming that fall-off we often see with traditional webpage transition. Go beyond the initial sign up, prompting them to add the slotted time to their calendars. When it’s time, send them personalized reminders through Messenger directly, ensuring your communication (and webinar) stays top of mind. See what I meant earlier about utilizing strategies you’re already familiar with to make a huge impact with a Facebook chatbot? Messenger Marketing doesn’t have to complicated — it just requires you to think about how to best design a conversation that your customer actually wants to participate in. Stay tuned, we’ll be back with more of these strategies soon! 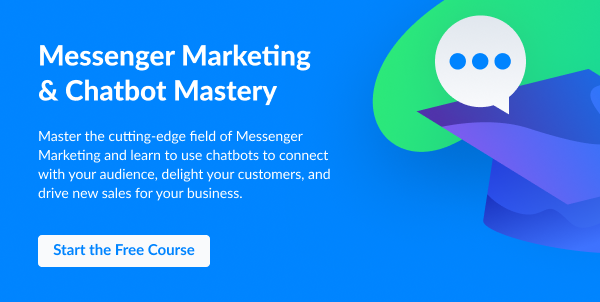 And if you haven’t yet gone through ManyChat’s Messenger Marketing & Chatbot Mastery, what’re you waiting for? Get started now.